Window tracks get really gross and dirty. 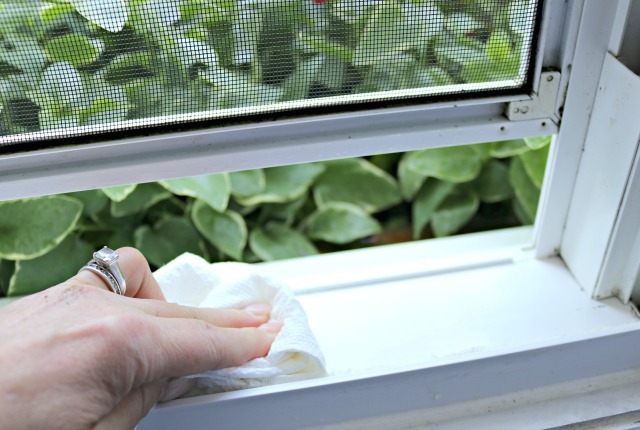 This tutorial on How to Clean Dirty Window Tracks will show you how to clean them in no time! On the outside of our home’s windows, the only thing protecting them from the outdoors is usually our window screens. They can get really dirty, moldy, and can even start growing mildew. I usually notice this problem twice a year. 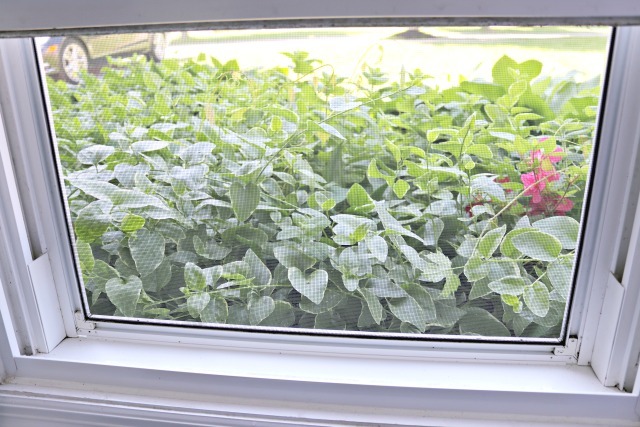 When spring comes along, I like to open all of our windows and let the fresh air and sunshine in. Then, in the fall when it cools down a bit after the long, hot summer, I like to do the same. 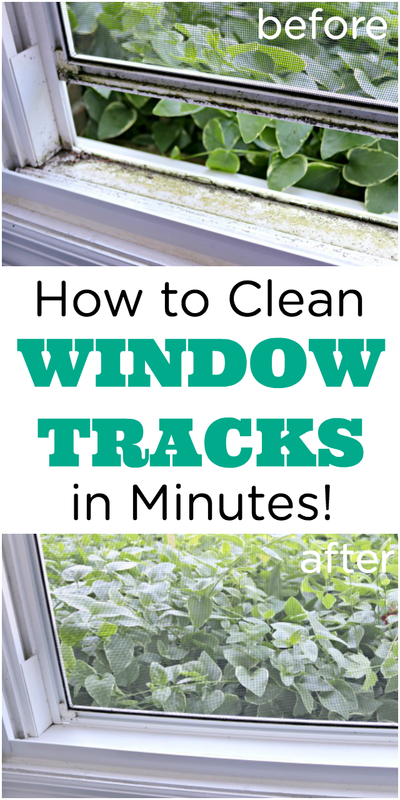 I used to dread cleaning our window tracks! I promise, it is much easier than it looks. Case in point…my dirty window tracks and screens. They look so gross. Step one is to pull the screen up just a little bit. This will allow any mess we make cleaning them to fall outside instead of inside our home. To get started, just take a paper towel or rag and clean off any debris that isn’t stuck on. I usually just dust any dirt out of the window. This post contains affiliate links, which means if you make a purchase using these links, I will receive a small commission. Next, spray the entire area with Distilled White Vinegar. The vinegar will loosen up any dirt, mold and mildew. 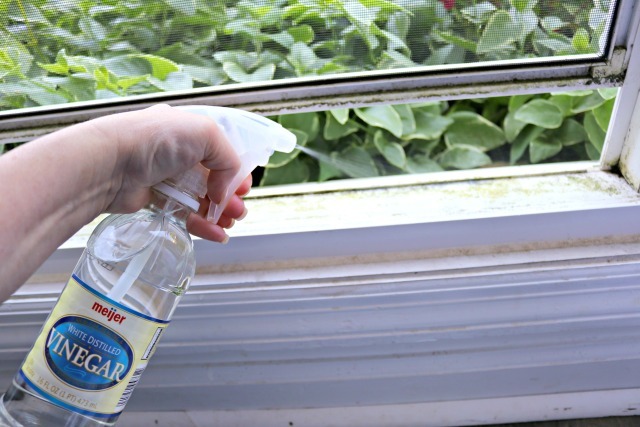 It will also help kill any bacteria that may be growing in your window tracks and screens. 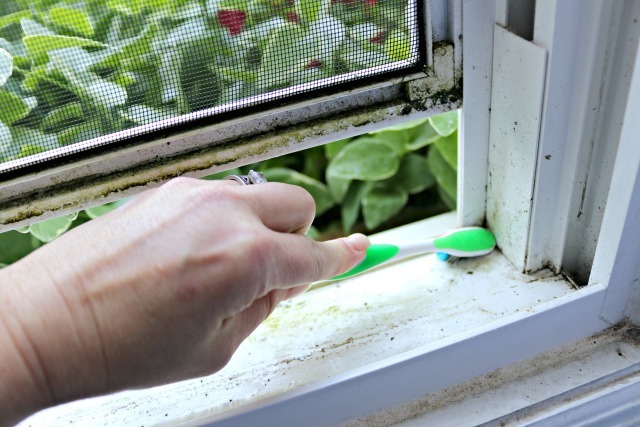 Next, take a toothbrush and scrub your window tracks, screen frame and in the corners. Now, rinse with water ( I usually just have a warm cup of water that I use), and wipe any left over debris away with a paper towel or rag. As you can see, the window tracks are all clean, and it literally only took 2 minutes! Take a look at the clean versus the dirty. Apparently, Nash prefers the clean side! 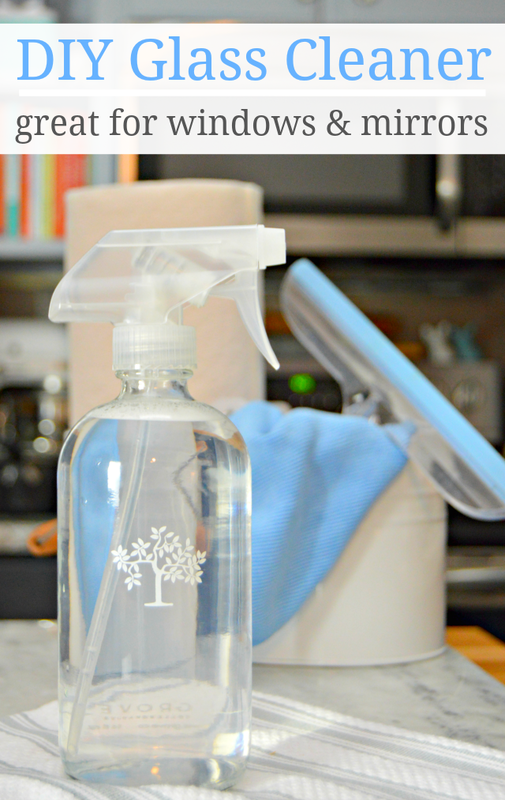 Find my Recipe for DIY Glass Cleaner for Windows and Mirrors HERE! 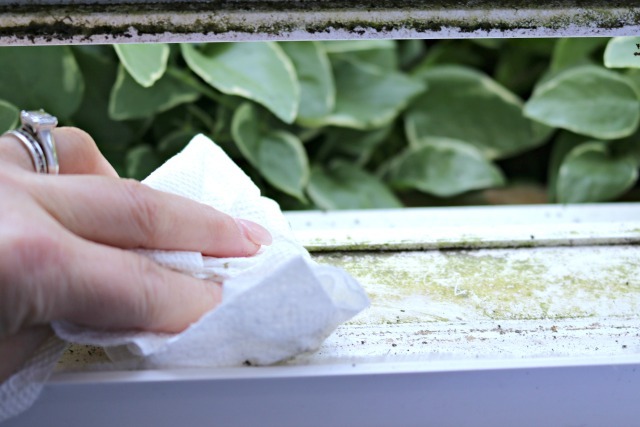 Check out the Easy Way to Clean Window Blinds HERE! 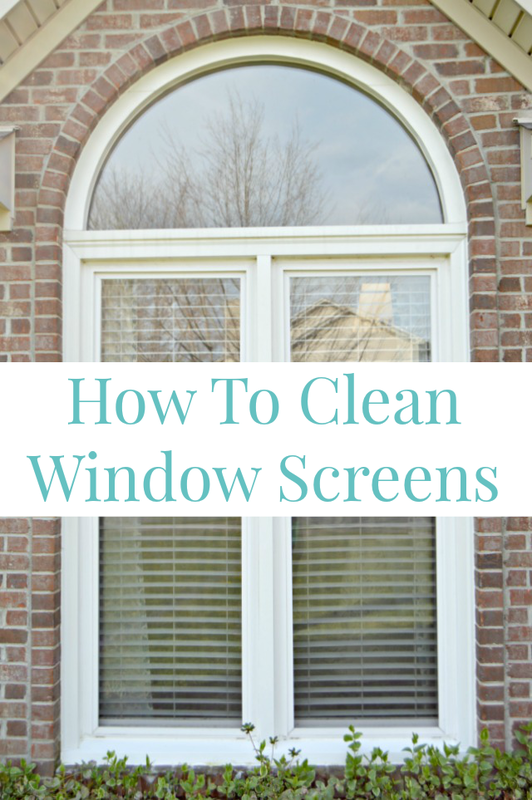 Find out my easy trick showing How to Clean Window Screens HERE! 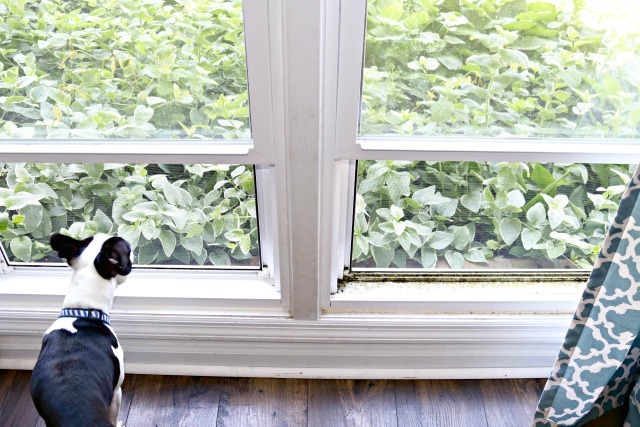 Is the track cleaner process safe for wood framed windows? 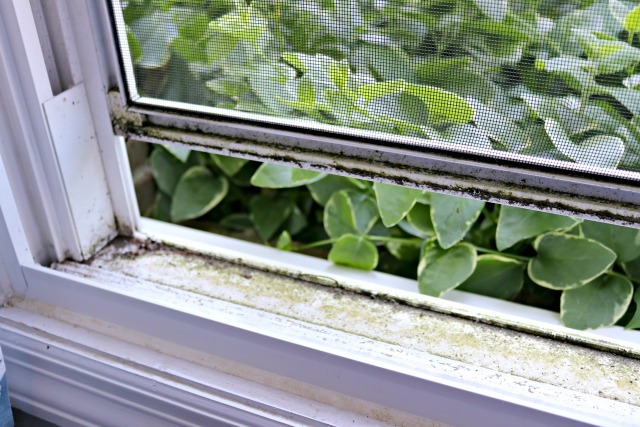 Yes, the mildew on the windows will do more damage than anything. The vinegar is just used to clean it. Also vinegar kills mold! Bleach just takes it away an it will come back. Use straight Vinager distilled white to kill any mold in your home don’t delute the vinager. Please help me!!!! I tried to clean between the glass on my oven door, all I managed to do is make it look worse, Noe I really can”t see between the panes of glass because all it is is a streaky mess. Try sprinkling with baking soda then spraying with vinegar. Let it bubble for a few seconds, then use a scubber to loosen up anything left behind. Rinse and clean again with vinegar and a paper towel or rag. How does that get in between the oven glass? Never heard of cleaning between that glass! Meow do you clean between the oven glass ? There are openings in top of oven door, possibly vents. Cooking spills can drip into these holes. The spill runs down between the two glass panes in the oven door. It’s a mess. How do you get in to clean? You have to take the screws out of the oven door. Be careful not to break the glass when taking it apart. This certainly beats Windex, etc. Thanks for caring about the environment!!!! Wow, nice job! I so needed this information. Thank you so much for sharing it. Please start reading rubber gloves for ALL your liquid cleaning. You may not notice it, however, your hands are drying out more than you think or observe. Just have extra pairs with your various buckets and bottles or a specific go-to place for hanging them. Just in time…cause I’m getting ready to clean my windows too and they look like yours! Thanks! Thank you for this tip. Heinz also makes a cleaning vinegar that’s a special cleaning strength. Comes with a blue and green label and will use this for this great window tip. does this work on shower door tracks also? I’m not sure because I don’t have shower doors, but it is definitely worth a try! HELLO AND THAKS FOR SENDING THIS TO ME BUT I DO HAVE A PROBLEM, MY SCREEN DO NOT CAME OUT. THEY ARE FIXED AND IS VERY DIFFICULT TO ME CLEAN THE TRACKS JUST WITH A PIECE OD RAG, HAVE TRY OLD THOOT BRUSHES BUT THEY WONT FIT, THE ONLY WAY IS FOR MY HUSBAND WET FROM OUTSIDE WITH THE HOSE IN JET BUT LOTS OF WATER DO CAME IN TO THE WALL, ANY SUGGESTION? How to get rid of the armpit smell on clothing. Even after I wash my grandsons clothing it still has the odor. He uses deodorant but???? Soak the deodorant spots on hydrogen peroxide for an hour before washing. If the odor is set in soak those areas overnight in peroxide. I use a wash rag soaked with peroxide and keep it over the stains wet with peroxide. You may have to do it twice to get it all out. Thanks for your posts. I often refer to them now to help me around our house. They are very helpful!